Home monitoring is becoming more prevalent nowadays. 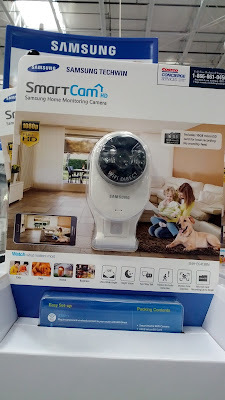 The Samsung Smartcam 1080P HD Home Monitoring Camera SNH-E6413BN is a great entry into home monitoring/security/surveillance without the outrageous cost and the complications with setup. For about $140, you get a full 1080P camera, 128 ultra wide angle lens, the ability to record video to a microSD card, night vision lens, and email notifications, and pan/tilt functionality. And with a trusted name like Samsung, you can be assured that this camera is of reliable build-quality. It can be used to view your front door entry way, as a baby monitoring device, or to view your pet while you are away. Streaming live video from the camera is possible via the downloadable app for the iPhone, iPad, and Android devices. I especially like the recording functions so you can go back to past events. A camera with a night vision lens is a must when monitoring baby or monitoring your front door at night. The included motion/audio detection can trigger email alerts so that you can be notified of an event and be sent a picture of what the camera is viewing real-time. 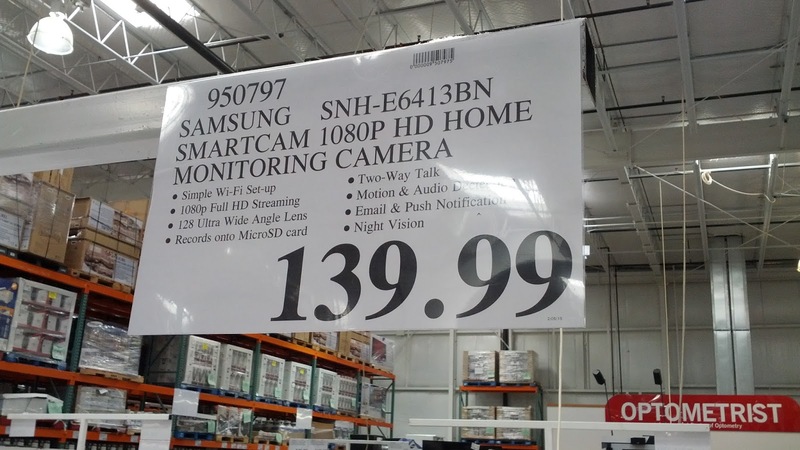 Alternatively, you may want to check out the new Samsung SNH-V6414BN Smartcam or if you're into Samsung surveillance cameras and closed circuit television (cctv) systems, the Samsung Samsung SDS-P5102 surveillance system . Samsung Smartcam 1080P HD Home Monitoring Camera SNH-E6413BN. Use the Samsung Smartcam 1080P HD Home Monitoring Camera SNH-E6413BN as a surveillance camera or a baby monitor. 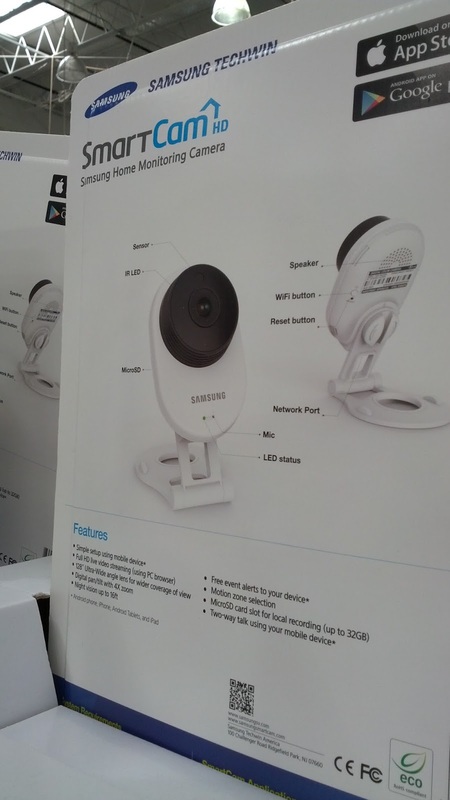 Record video using the Samsung Smartcam 1080P HD Home Monitoring Camera SNH-E6413BN. Designed for optimum performance with 1080p Full HD video quality, simple set-up and an intuitive experience, the SmartCam HD Pro provides the high caliber video experience you would expect from Samsung. The SmartCam HD Pro can be easily customized to instantly alert you to both motion and audio events so you won’t miss a thing! The SmartCam HD Pro delivers real-time notification of activity through your iPhone, iPad, or Android smartphone or tablet. It also has a built-in slot for a microSDXC memory card which allows for video storage for later review. Once you’ve downloaded the Samsung SmartCam app and have set up your SmartCam HD Pro, there are no extra costs or monthly fees for viewing or storage. The SmartCam HD Pro WiFi IP camera introduces many advanced features such as Wide Dynamic Range, Samsung Light Enhancer, Advanced Motion & Audio Detection, and Motion Zone Select. Each camera is equipped with a built-in microphone and speaker for crisp, clear Two-Way Talk ─ one more way Samsung helps you be in two places at once! brought one over the weekend, not a bad unit, 1080p not really viewable on the mobile app, only on PC web browser. overall quality is good. do wish I can access the store sd video over the network, instead of using the app. I found the same thing with other cameras with SD cards where viewing the stored videos was a pain. I decided to use the BlueIris software running on a PC. It records video to the PC and handles playback. Playing videos is easier and provides a DVR-like experience. I then use the BlueIris iPhone app to interface with the BlueIris server.